In November 2017, Prince Harry and Meghan Markle posed outside Kensington Palace for their first official photocall as a royal couple. 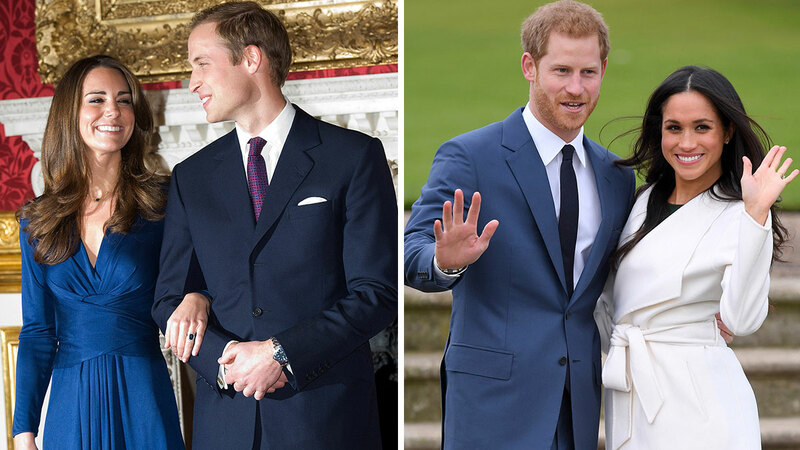 While they looked as beaming and in love as William and Kate did when they announced their engagement back in 2010, there were a few key differences between the two moments. Here, we break them down. 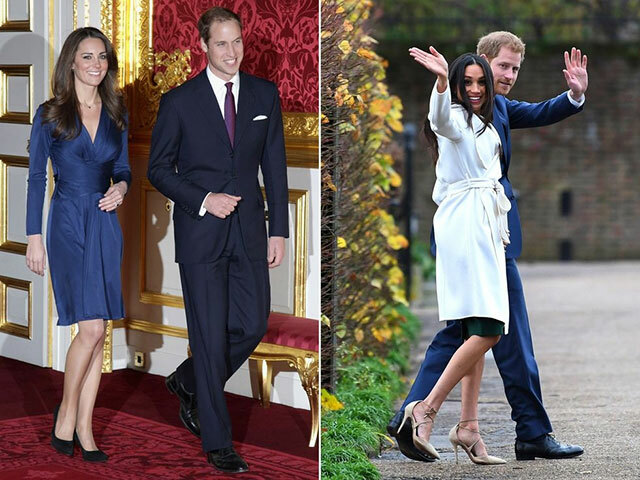 While Kate and William chose to hold their photocall inside a grand room of St James’ Palace, Harry and Meghan opted for something a little more low key: the gardens of Kensington Palace, the place all four royals now call home. 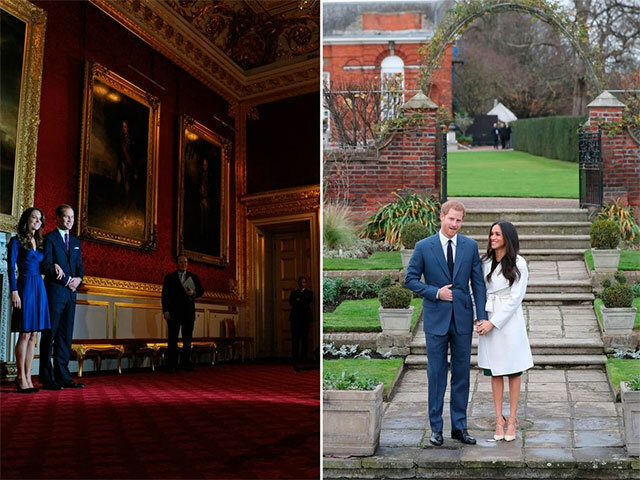 Despite the bad weather, the couple decided to hold the photoshoot outside, which—whether intentional or not—gave it all a much more informal feel than the rather majestic hall that William and Kate stood in for their engagement. In part due to the setting, Meghan’s ensemble was significantly more casual than Kate’s, who opted for a navy silk cocktail dress by Issa. In contrast, Markle chose a simple white wrap coat by Canadian brand Line the Label, an ensemble that had more of a relaxed, daytime feel. While we still don’t know what the dress underneath looked like, it appeared to be a forest green frock that finished just below the knee, more workwear than formal. 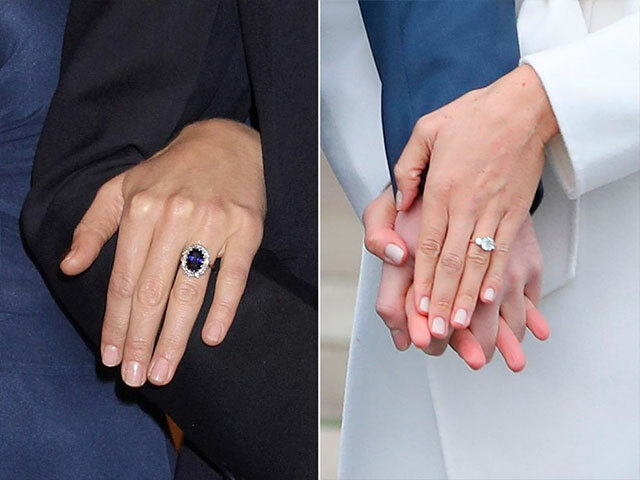 While they are both absolutely beautiful, the two engagement rings worn by Kate and Meghan are very different. Everyone knows, of course, that Prince William gave his fiancée the engagement ring worn by his late mother Princess Diana. It features 14 solitaire diamonds, which surround a large sapphire stone set in white gold. Meghan’s ring also features stones from Diana’s jewelry collection, but was not an heirloom and was instead designed by Harry himself. It was reportedly made by Cleave and Company Court Jewellery and Medalists to the Queen, and sees two of Diana’s personal diamonds sat alongside a diamond from Botswana, a country that holds a special place in the couple’s hearts. 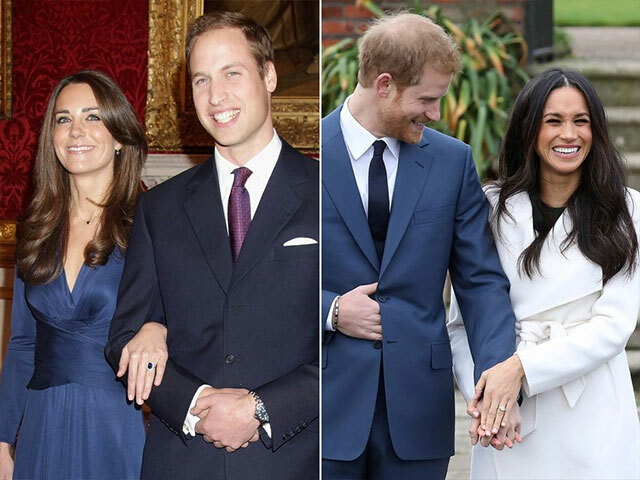 As well as this, Meghan and Harry are older (36 and 33, respectively) than William and Kate were when they became engaged (both 28). This meant that they appeared to be more confident and comfortable in front of the cameras than the now Duke and Duchess of Cambridge, who seemed a little less at ease. For a number of reasons, Harry and Meghan’s moment seemed a lot more relaxed. Of course, unlike William, Harry is not first in line to the throne and has therefore always had more freedom—and even has the option to forego a public wedding. 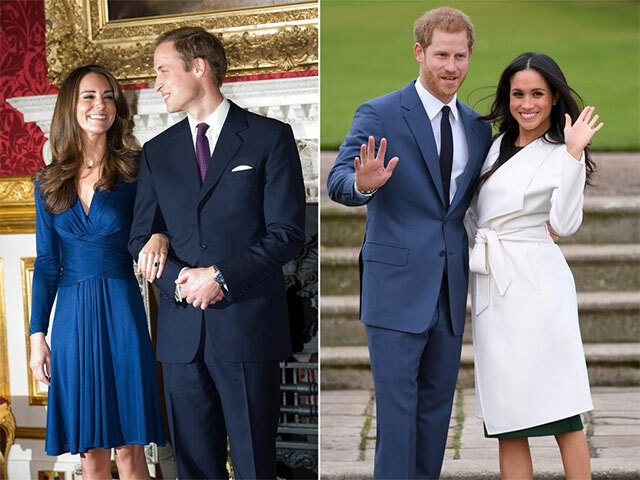 For this reason, along with Meghan’s experience with the press, the outdoor setting and the couple’s maturity, the whole affair seemed much more relaxed than when William and Kate got engaged. We will just have to wait and see if the wedding will follow suit.